From Mighty Morphin to where the series ended, discuss everyone's favorite team of multicolored superheroes from Japan. Ahh yes, Power Rangers the main show I remember the most from the 90's that killed off some of the popular shows of the past(TMNT) and inspired a slew of imitators(Tattooed Teenage Alien Fighters from Beverly Hills and Superhuman Samurai and the Cyber squad but granted Samurai wasn't really one but it was brought to the states to cash in) and not to mention it caused some controversy with the whole "It's too violent" and the supposive hidden racism but to be honest, they never really thought of that when they casted the actors... And that's probably because iT'S A FRIGGIN KIDS SHOW!!! >_< And ever wonder why no one brings up that the red ranger is native American? But back on track, I felt like making a new topic of this because the old one vanished and linkara's history of Power Rangers sort of gotten me back in the series alittle and never really thought that deep on the series itself. Now as for favorite series to me, the classic will always be number one regardless of the cheese factor. And I must say I do kind of like the newer series, Dino Thunder being my top favorite for having Tommy, dinosaurs, and a new evil ranger that REALLY oozes with badassness. Infact up until mystic force, where I began to lose interest none of the series I felt were that bad and offered some interesting ideas and such. Now favorite ranger... Pretty much all incarnations of the red rangers have done good jobs(Yes, I like rocky!!!) and some have broughten new things to the team. Favorite Zord/Megazord... All of them. XD Though top fav would be the classic, dragonzord, Serpentera(Friggin love that robotic dragon design), the wildforce megazords, and Dinothunder's. So with that out of the way, what do you all think of the series as a whole? Any of you watch sentai at all? Kind of angry how they changed somethings from the original series with the American series? Now I would agree on some if I saw them but I will say this... I'm glad they didn't kill of tommy in MMPR because obviously I would of cried but it would of caused an outburst/backlash of anger FAAAR worst then that of Optimus Prime's death. Yes, I am lazy and I copied and pasted that from my topic from the old forum so sue me. Also Linkara is the man with his latest awesome related Power Rangers update. mecha-gino wrote: And ever wonder why no one brings up that the red ranger is native American? Which Red Ranger was Native American? Jason, the original red ranger is part native american and I believe Tommy is too. I think there was a big storyline about Tommy's brother who was clearly native American. I like In Space myself as one of my favorites, Wild Force and Time Force are up there too. And same here, up until Mystic Force I loved the series, it headed south from there till RPM, which despite the sillyness of the suits and mecha, was an awesome series, the only thing I fault Disney for there is the terrible theme song. I love RPM, it's among my favorite series, at least of the Disney era. And now Saban has the rights back and we'll have Power Rangers Samurai, and from the looks of it, we'll have at the very least a nostalgic series by how it seems they're going. Also, we do know now, from various sources, that at least two past Rangers have signed on for something, the Wild Force Red RAnger and Turbo Blue Ranger have both been confirmed to have a role in Samurai. My bet? They're planning a big special of some type to celebrate getting the rights back, but that's just my idea. I can almost be assured that soon we'll hear Jason David Frank will be involved. Also, intresting fact about Dino Thunder, Zeltrax was originally intended to turn out to be Billy from Mighty Morphing, but the actor turned the part down. Godzillawolf wrote: I think there was a big storyline about Tommy's brother who was clearly native American. Awww Man... really? I would of loved to see Billy again and it would of been interesting. And the male stripper and the little boy are coming back!? YAYS! I'm totally watching the series now. I am however kind of curious as to the whole dvd situation. Yeah, and I think Jason was supposed to be the original pick for the Black Ranger, turned it down too. In fact, Jason was originally intended to die in Forever Red, but his populaty saved him. Yeah, I'm looking forwards to it too, though he's not a little kid anymore, it's still intresting. Bulk is making a return for the new series... I came. 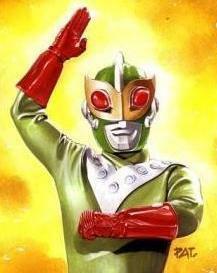 if JDf comes back please let him be green and let dragonzord comeback. Or just bring dragonzord back a the 6th zord. miguelnuva wrote: if JDf comes back please let him be green and let dragonzord comeback. As much as we'd all love to see that, it ain't gonna happen. That would require Toei to create new tokusatsu footage, which I don't think they're gonna do. I don't see why saban couldn't just make the footage. I heard he was going to make a come back after the return trilogy as either a the tommy clone,jason or a new character. Shogun megadragon mega falcon zord would have been sick. Seriously? It's one thing to shoot the live action footage - that's a piece of cake. But shooting new footage with the Dragonzord would mean building a new suit - because Toei most likely didn't save a 20 year old zord suit - building a miniature set, importing whatever existing monster/zord suits are needed, and somehow fitting it in with the existing Sentai tokusatsu footage. It's not as easy as it sounds. You really think they would abandon the original Dragonzord suit!? Lol on you, no it's in a museum somewhere in asian. I myself wouldn't mind if it was just CGI instead, you know make it easier to show. they also have stock footage to summon the zord and then have toei reshoot some of the battles and then saban could just reshoot some scenes of the red ranger playing the dagger. Or they could cgi dragonzord. Scroll down a little bit to Find the Gokaiger teaser. Though Tommy will need to be Gokaiger blue since yellow is a chick this time. They need to release the original series on DVD. mecha-gino wrote: You really think they would abandon the original Dragonzord suit!? Lol on you, no it's in a museum somewhere in asian. It's highly doubtful that the original filming suit has survived after 20 years. They disintegrate over time. Do you see any original Godzilla suits pre-2000 on display at any Japanese exhibit? No. It's highly likely, however unfortunate, that the Dragonzord suit is gone. Building a new one would take time and money. And I don't mean to sound like a CGI Dragonzord would be sacrilege, but it would be pretty lame, considering the CGI on the recent Sentai series is pretty subpar. Half the fun of the Dragonzord is knowing it's a man in a suit a la Godzilla. miguelnuva wrote: they also have stock footage to summon the zord and then have toei reshoot some of the battles and then saban could just reshoot some scenes of the red ranger playing the dagger. Please understand that both options of filming new footage or doing CGI requires much more money than these shows have. Power Rangers is a low budget program, and they use it to film new live action footage and integrate it with existing scenes. Their production schedule is very tight and swift, too much so for that kind of new footage. Showa Gyaos wrote: They need to release the original series on DVD. There's a museum in japan or something that shows off some of the power rangers suits and zords and I recall seeing the dragonzord there and the tyrannosaurs rex zord too. mecha-gino wrote: There's a museum in japan or something that shows off some of the power rangers suits and zords and I recall seeing the dragonzord there and the tyrannosaurs rex zord too. It's good to know that they don't throw their suits away. I just watched the "premiere" of PR:Samurai and I was pretty disappointed. The episode wasn't even a pilot, it felt like it should have been the 4th episode in or something like that. - The fight choreography was decent. - The new American footage was integrated very well with the Japanese. - It was nice to see more traditional tokusatsu for the zords instead of crappy CGI. - Although more pop-ish, the use of the original PR theme. - There was no explanation of who the rangers were or how they got their powers. - No idea who the villains are or why they're out to conquer the world. - The acting is pretty cringe-worthy. - Editing would make Michael Bay proud. - Bulk's "partner" - apparently Skull's son - is annoying as hell. I get that it's the whole "like father like son" kind of joke but the kid does a flat, shrill imitation that comes off as just plain bad. - While it's nice to see Bulk (and he's apparently going to be a regular character), his involvement in the episode served no purpose to the plot. I sincerely hope that's not how the rest of the series will play out. Again, this episode didn't feel like a pilot at all. If it indeed was the actual pilot, this does not bode well for the series.